The Moto G 3 is packed with cool features that make each smartphone with a unique style. It can change the profile information and background, add widgets, and other customization options. Functions are native and don’t need any extra application: just make changes to the smartphone system. Check out five interesting tips to customize the Motorola Moto G 3 smartphone. The phone offers several background options, from colored models to image galleries. To access the wallpaper list, simply press any space on the screen for a few seconds and then select the option menu. Open a list of options at the bottom of the display: slide to the side and check images available. Confirm "Set Background" at the top. Widgets bring convenience to everyday life, as they allow quick add function on the smartphone screen. It can put a clock with weather forecast, latest pictures of icons from the gallery and more. Adding these functions is simple: just press the screen on any empty space for a few seconds, then select "Widgets". Slide the screen to find what you need and press the item. Then drag it to the position you prefer. The Moto G 3 allows the user to add their personal information on the internal profile such as name, picture and other custom data. To do this, open the notification bar at the top of the screen and tap the Profile icon in the upper left corner, which will show your photo rather than a "puppet". Tap the item of "pencil", make edits you prefer and ready. To simplify time to view messages on your phone, the Moto G 3 allows you to enable the screen to display notifications. Thus, the user can see interactive icons, a list of alerts of the latest messaging and other options. To access the feature, tap "Setting" and go to the menu "Screen" and then "Notifications on screen." Select the item you prefer and it will be saved automatically. 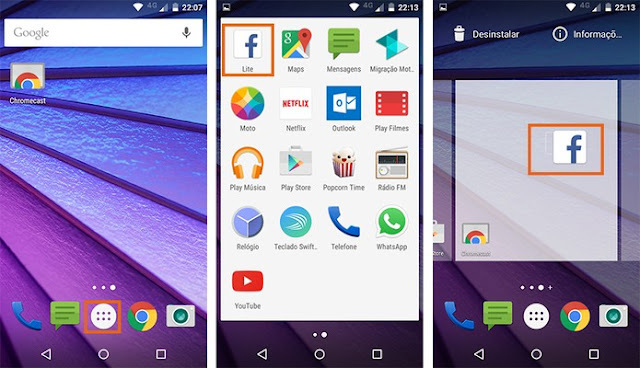 Want to add the favorite social networks on your home screen? Then check out the simple tip for this. Access the menu with all applications in the Moto G touching the round button in the center of the screen. Find the application Facebook, Hangouts, WhatsApp or messenger or social network you want. Touch the icon and hold for a few seconds, then drag it to the main phone screen. For those who want to also customize the external design of the smartphone, please note that the Moto G 3 has the Moto Maker feature. The service allows you to change the colors of the back, front and other details, and add a phrase printed on the cover. The functions can be selected by buying at the Motorola website.